Credit — Gengarry Glen Ross: We won’t go as far as being sales douches, but you need to close investors, customers, and partners. It might come as a surprise to you — especially in today’s build-centric startup world — that being able to create, is in fact, not the marquee quality of a great entrepreneur. Before you go reaching for your pitchforks and torches to burn me at the stake, keep an open mind and hear me out. These days, there is a lot of love to go around for engineers who can spin out a quick prototype, and justly so. For without implementation capabilities, ideas will forever remain fanciful (or torturous) dreams. There, now that we’ve paid due respect, let’s proceed. Now, more than ever before, we are in no short supply of talented and skillful builders and creators. Skill acquisition is at the fingertips of all who wish to attain it, in large part, because of accessibility to knowledge and the venues available for training (barring extenuating circumstances). Formal education, learning apps, meetups, seminars, books, workshops, and bootcamps abound. And still, many smart builder-entrepreneurs continue to fail at rearing successful startups. Why? To be sure, there are plenty of extrinsic challenges that plague a startup (or any business for that matter). But in this article, I will be focusing on the native qualities of an entrepreneur, and more specifically, talking about selling (or lack thereof). We’ve all heard it before — “Show, don’t tell!” or “A picture is worth a thousand words!” or any other variant of the cliche. Selling is an art and it takes practice and time. But most people who haven’t sold before, simply don’t get the experience to learn it. And so, for a while, those who accrued the skill to build things began relying (heavily, and almost exclusively) on showcasing demos and prototypes to do the sales work for them. And to a great extent, this works. Early investors focused on the technology were willing to overlook the in-eloquence of a founder, in so far as they could understand what they were looking at or playing with in terms of the MVP (minimum viable product) or POC (proof of concept). In fact, a counter-culture of appreciation for “un-smoothness” or “cute awkwardness” began to sprout up as a charming contrast to the unctuous salesman looking for fast funding or a quick commission off of a sale. 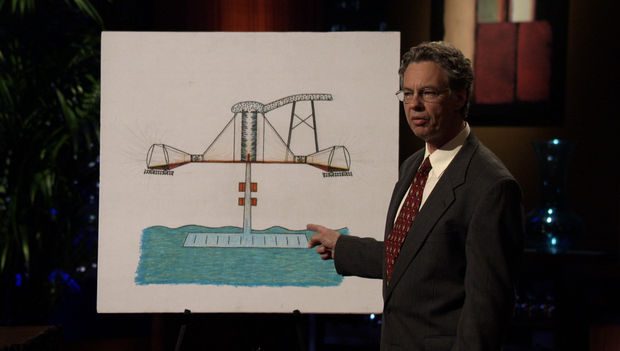 Credit — Shark Tank: Espisode in which an awkward self-proclaimed MENSA scientist claims to have figured out a technology to create giant water tornadoes that throw off gold and other valuable minerals. I think so. I think we’ve been over-indexing on making an excuse for poor salesmanship, and deluding ourselves into believing that smart and talented entrepreneurs who have endearing social awkwardness are somehow secretly innocent geniuses who will almost accidentally conquer the brave new world. But the truth is, while that might work initially, this bug packaged as a feature quickly loses its flavor as a startup transitions into a professional business that will depend on selling to customers, partners, and more investors. The idealist and naivete inside of us all wish that superior products simply sell themselves — The world is a place where bias doesn’t interfere with consumer behavior or enterprise buying cycles. All we have to do as entrepreneurs is throw the proverbial “useful” product into the ether that is the marketplace and somehow, magically, the world will gobble it up. Yet, nothing could be further from the truth. And this excessive focus on building something quickly and iterating — while valuable and oft-promulgated by entrepreneurs and investors like Paul Graham or Eric Reis — has become insufficient in an increasingly competitive landscape where high quality has become commodity. All you have to do is look at evidence that points to the simple notion that products (creations) don’t sell themselves. People sell products. Credit… um.. to Taylor or Google…? Taylor Swift is talented and skillful as both a songwriter and singer. But first and foremost, she’s a marketing genius and a class-act of a saleswoman. Do you really think that on a planet of more than 7 billion people, there is no other person like her who has as much (or more) musical talent? There definitely is, but that doesn’t mean that they are as successful of a business as Taylor Swift. Yes — I did just call Taylor Swift a business. She is not just an artist. She is the product, the sales, the marketing, the bottom line… the business. Taylor Swift is known for how well she manages her appeal to the public by maintaining a classy persona, minimizing over-exposure, and meticulously planning her album roll outs with crafty debut scheduling and singles launches. Right, now that’s a sales pitch. What about Elon Musk? This man is an engineer. He builds his way to victory, right? Yes, he has, and will continue to do so. Yet, that’s not what separates him from the pact. His salesmanship is so skillful that you can’t help but to love him. A mission to mars, the romance of rockets, electric cars, underground tunnels, and flamethrowers are the stuff of dreams. I’m not denying that he has raw engineering capability. But Elon’s magic is that he now sells ideas before he even builds them. He can sell this stuff because he’s transformed himself into a product we all buy — a dream machine. Oh, you want to talk about Neil deGrasse Tyson? He’s a scientist. He has written award-winning peer-reviewed academic papers on astrophysics. He’s proposed new theorems and re-shaped the way we understand our universe. Research, in essence, is his product. Yet, there are countless numbers of PhDs slaving away in basements and labs of unknown universities. While it’s true that Dr. deGrasse Tyson is a titan among academia, it is no stretch of imagination that he is also a king of salesmanship. He has transformed himself into a business, earning on average between $25,000 and $30,000 per talk or speech, hosts the Cosmos TV show, and has a net worth of more than $2M (likely an underestimation). Do you know why? It’s not because he’s the only smart and prolific astrophysicist around. It’s because he’s highly marketable, he’s charming, and he knows how to talk about science in a fun, digestable, and marvelous way to engage the listener. Half of the time, he’s not even talking about science — he’s making loose science analogies and metaphors that connect with audiences’ daily lives. He’s an entertainer (and that in no way takes away from his academic achievements). At some point, just showcasing your technology isn’t enough. Believe it or not, competition exists in any space that has room for profit. New entrants will quickly enter with comparable alternatives that deflate margins. Incumbents (reputedly slow to innovate) possess massive resources to drive prices downwards as well. The key to both building up and scaling out a successful startup, is sometimes less about how “good” your product is, and often more about how “good” your sales strategies are in relation to your investors, your customers, and also your business partners. If you dismiss everything thus far, so be it, but if you’re an entrepreneur or even a seasoned business veteran, then I implore you to at least take away this: If you can’t explain your product or service in one simple sentence, you don’t know what you’re selling. The one-sentence thesis, as I call it, is not designed to answer all questions. Rather, it’s designed to incite more curiosity, without being a fluffy statement. Research shows that people are accustomed to remembering lists of three, especially during pitches of any kind. So keep it simple, straightforward, and brief! Don’t believe me? Google it. In 2004, when I built my first startup, investors asked me what the f*ck I was building (and yes, my investors were pretty brutal and impolite — they make Shark Tank drama feel like bowling with guardrails. Chinese investors are accustomed to getting to the point quickly, and contrary to old-school business etiquette, there isn’t a lot of niceties and get-to-know-you type of hogwash). I started off with a long-winded elevator pitch that I’d practiced several times. It came off boring, un-organic, and completely uninspiring. The gentleman was kind enough to stop me midway and said, “If you could tell me one sentence, what would it be?” That might seem harsh, but it’s pretty reasonable. People are busy, and you need to get to the point without compromising the sales message. Tech that does price optimization. How will your target customer benefit? A proper one-sentence thesis is only the start of a good pitch. And a proper sales pitch is only the beginning of a sales process. The point though, is that the one-sentence thesis is a great communication tool and it forces the entrepreneur to think carefully about what it is she is doing. Distilling your business identity, product, and customer segment into a simple understandable sentence is no small task. Less is more. The purpose of this article is to share that selling is an entrepreneur’s key mandate. If you can sell, you can onboard smart team mates who can build. If you can sell, you can get early customers to test your product. If you can sell, you can persuade investors to fund your project. If you can sell, you can partner with distributors, suppliers, etc. If you can sell, well.. you can sell your company one day as well.